Superman stops Lex’s latest attempt to kill him and asks him why he hates Superman so much, but Lex tells him he wouldn’t understand. Then goes into his next plan, to replace Superman with a new hero, Superior-Man. When Superman shows no concern that the new hero in town is taking all the press (because that’s not what Superman is about), Superior-Man attacks him and during the fight is revealed to be Metallo, brainwashed and shoved into a new body. Back in (the best equivalent to) his right mind, Metallo goes after Luthor and Superman is forced to save him. Superman tells Lex he could be using his genius to benefit humanity but all that does is make him want to kill Superman even more. Why? When he was a boy he dreamed that he’d get away from Suicide Slum and his drunken father and that someday everyone would look up to him. Kind of hard when the guy above him can fly. What they got right: While we do see more of what makes Superman what he is by not leaving simply because he’s not the hot news story anymore, this is clearly a Lex Luthor story. Not only do we see what makes him tick and what he really desires (of course, how he goes about it is wrong), we also see in the design and persona of “Superior-Man” how warped his view of Superman and possibly other superheroes is but how little he thinks of the masses in how they’ll accept this overpowered superegoed newcomer. Lex is upset because of a statue dedicated to Superman because others paid for it while Luthor has to spend his own money to get his name on things. As a kid he talks about wanting everyone to look up to him, but he has to watch Superman literally and figuratively rise above him. It’s a great character study as to what makes Luthor who he is. What they got wrong: How did Luthor have an opening to brainwash and rebuild Metallo? And how will Metallo get his previous mechanical body back for future appearances? 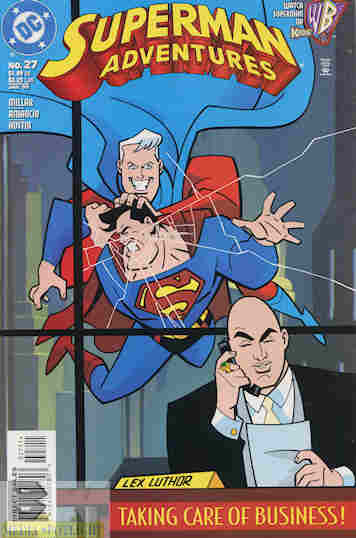 Recommendation: A great Superman/Luthor story. Worth adding to your collection. Posted by ShadowWing Tronix on February 24, 2018 in Animation Spotlight, DC Spotlight, Television Spotlight, Yesterday's Comics and tagged DC animated universe, DC Comics, DCAU, Lex Luthor, Metallo, Superman. I’ve been watching Superman: TAS for the first time in about twenty years. Brilliant stuff. Cements my refound appreciation of Superman the character. Tim Daly and Clancy Brown do such a great job. It strikes me that Lex – this version and the others – pretty much fits what I’ve gleaned about clinical narcissism since then. He wants all the love and attention, despises whoever gets any instead of him, and will do anything and carry out any scheme to put the other down and reclaim the spotlight, all the while doing his best to keep up the facade of the kindest, most worthy man in the room. And of course, at the point of Lex being at the peak of his power and influence, the only one who can really display more power and good works (though for different reasons) long term, in Metropolis, is Big Blue. I haven’t read this comic, but what you say about Lex’s ‘warped view’ of superheroes, and how he thinks others might view them, sounds interesting. I wonder if the series ever made it to kindle…? ComiXology has the series up and Amazon basically owns ComiXology now (if you have an Amazon account you can access their offerings) so probably. There are also back issues and I think trade collections if you prefer physical copies. I should also note that Superman Adventures and the other DCAU tie-in comics are not canon to the cartoons, and at times (this is a constant complaint in my reviews) forget they’re not taking place in regular DC continuity of the time. But they’re usually enjoyable for what they are.